We've ranked the best gadget insurance companies based on the level of cover they offer and customer reviews. We've also compared their cover to highlight features that may help you make a decision about getting insurance. Get 22% off gadget insurance from i-Digital, when you join one of our gadget insurance groups. 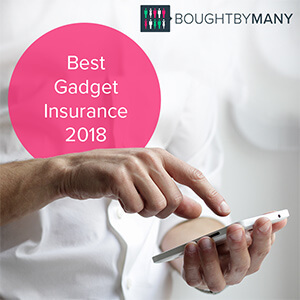 We created our top 10 gadget insurance policies based on real customer reviews, a score relating to the quality of cover from an independent financial services rating firm, and any awards a company has won, as opposed to which companies are cheapest. Policies are also rated by customer reviews from websites like Reviewcentre and Trustpilot. Some of the important things to look for are accidental damage, theft, loss and breakdown. Most of the gadget insurance policies in our top 10 include this cover as standard. You might pay a little bit more for insurance that includes cover for these as standard but it's better than paying for insurance that offers no payout when you lose your phone or iPad. What types of gadgets does gadget insurance cover? Looking for mobile phone insurance in particular? Check out our guide to the best mobile phone insurance policies. Consider the price of the gadgets you own: do you own a phone that costs £1,000 or an older one that is less than £300? If you have an iPhone X, paying £10 a month for a gadget insurance policy might be a good idea as it can cost you hundreds of pounds to replace or service it in case of damage. Although travel and contents insurance might have certain levels of cover for gadgets, the limits are usually low and the protection may not be sufficient to protect your expensive laptop or mobile. That said your home insurance policy might offer a certain level of cover for certain types of home electronics. For example, you might want to check whether your game console is covered by your home policy before including it in your gadget insurance policy as this might increase your premiums. See Are you already covered under your home insurance? How much is gadget insurance? The above quotes were obtained in November 2018 from CoveCloud. Are you already covered under your home insurance? In the table below we compare the best gadget insurance policies, including looking at loss and worldwide cover and the maximum age the gadget can be. All of the policies in our top 10 include theft, accidental damage and liquid damage. Most have no limit on the number of claims you can make but it's important you check whether your provider includes a limit. It's important to consider the excess, this is the amount you will have to cover if you make a claim. Although most of the insurers in the table below have similar excesses, there's still a big difference between £25 and £75, especially if you're getting cover for a cheaper phone. LoveitCoverit offers two tiers of cover: Plus and Premium - the information in our table is based on LoveitCoverit's Premium cover. LoveitCoverit will cover accidental damage and liquid damage and loss and theft on the Premium cover anywhere in the world. Unauthorised use is included for up to £10,000 on the Premium policy. LoveitCoverit will insure older devices as long as they are not older than three years. The policy includes a 12-month warranty on replacements. The Premium policy allows unlimited claims and repairs. You can get a quote from LoveitCoverit here. They offer a 10% discount when you insure more than one device. LoveitCovertit's mobile phone insurance is underwritten by AXA and is rated 5 Stars by independent review site Defaqto, making it 'an excellent product with a comprehensive range of features and benefits'. On customer review site Trustpilot, LoveitCoverit currently has a 8.6/10 rating for its mobile phone insurance. Get a quote from LoveitCoverit here. Gadget Cover is a fairly small UK company, offering insurance for phones, laptops and other gadgets. Its gadget insurance protects against theft, accidental damage, breakdown and liquid damage, with loss cover as an additional extra. You can get a quote from Gadget Cover here. Gadget Cover is rated 5 Star out of 5 by independent review site Defaqto. At the time of writing, Gadget Cover currently has a 5.1/10 rating for its mobile phone insurance on customer review site Trustpilot, based on over 851 reviews. Protect Your Bubble gadget insurance offers cover for theft, accidental damage, breakdown and liquid damage, with loss cover as an additional extra. At the time of writing, Protect your Bubble had a rating of 8.6/10 on Trustpilot based on over 15,000 customer reviews. You can get a quote at the Protect Your Bubble website. Switched On's Ultimate Cover includes accidental damage, breakdown and malicious damage, theft and loss cover. It’s worth noting that theft and loss aren’t included in its more basic policies. You can get a quote from Switched On here. On customer review site Trustpilot, Switched On has a 7.6/10 rating for its insurance, based on over 200 reviews, and on Feefo it scores 3.9/5 from over 80 reviews in the past year. i-Digital offers three tiers of cover: Essential, Essential Plus, and Premier - the information in our table is based on i-Digital's Premier cover. i-Digital will cover gadgets against theft, accidental damage and breakdown under all three tiers, with loss cover available under Essential Plus and Premier. i-Digital has a slightly lower excess than some of the other policies we looked at – £25-£50 depending on the type of gadget and claim. The Gadget Buddy policy we reviewed includes cover against accidental damage, breakdown and malicious damage, theft and loss. Theft and loss aren’t included in its more basic policies. Get a quote from Gadget Buddy here. Gadget Buddy restricts its cover to gadgets up to 18 months old. On Feefo it scores 4.3 stars out of 5 from 16 reviews. CoverCloud offers three tiers of gadget cover – Standard, Premier and Elite. Elite Cover protects against both theft and loss, as well as accidental damage and breakdown. Unlike most other providers, CoverCloud allows you to choose your own level of excess, from £50, £75 and £100 per claim. The higher the excess, the lower your premium. On customer review site Feefo, it scores 4.4/5 from over 200 reviews in the past year. Like many other gadget insure providers, Insure My Pocket offers three tiers of cover – Silver, Gold and Platinum. We focused on Platinum, which provides cover against theft and loss, as well as accidental damage. Helpucover gadget insurance offers cover for theft, accidental damage, breakdown and liquid damage and loss. Unlike the rest of the policies and providers we looked at, Helpucover offers a fixed price of £14.99 a month. The policy gives you a maximum of £1,500 worth of cover each year, and you can register an unlimited number of gadgets worth under £150 (such as cameras or sat navs). Helpucover also has a fixed excess of £50 per claim. Insure and Go gadget insurance offers two tiers of cover – Standard and Elite. Elite includes protection against theft and loss as well as accidental damage and breakdown. Like CoverCloud, Insure and Go gadget insurance allows you to choose your own level of excess. Home insurance policies sometimes include gadgets as part of your home contents cover, which means that your laptop, phone or tablet could already be covered for theft from the home or if there’s a fire. If you have accidental damage cover, your gadgets may also be covered for accidental damage while they're in your house. However, it’s important to note that your gadgets won’t be covered while you're out and about, unless you take out additional personal possessions cover. It might not add much to your premium but be aware that the excess might be higher than with a specialist gadget insurance policy, and you may lose any hard-earned no claims discount if you make a claim. See if your home insurance provider made it into our Top 10. Common exclusions - don't get caught out! Gadget insurers have come under fire recently for having exclusions that many people think would be covered under a normal policy. You could also check out our article about the Insurance T&Cs you wish you'd seen for more information. Join our gadget insurance group.